Lock in a great price for Hilton Garden Inn Colorado Springs – rated 8.4 by recent guests! Great responsive staff, good restaurant. I was stuck at this hotel for about a day and a half during a really bad blizzard and it was surprisingly comfortable in my room waiting out the storm. The restaurant staff stayed overtime to feed all of the guest that were stuck which was much appreciated. The front desk manager is amazing at his job. Very pleasant and extremely helpful. Really nice location. It has a outdoor mall with plenty of shopping and dining right across the road. Easy access to the interstate to be able to get to all of the attractions. The room was very clean and well maintained. The complimentary infused water and oatmeal cookies for the afternoon were a nice touch. The view from the 3rd floor overlooked the mountains and pikes peak. The cleanliness, niceness of staff, and delicious breakfast. Workers were nice. The microwave in the room was useful and helpful. The view was good facing the mountains! Rooms/beds very comfortable, view from room was amazing!!! Staff was very friendly. Our son was injured while we were there, and three men on the maintenance staff spent their morning helping him, helping us locate a nearby clinic, and making sure we made it safely to the car. They went far beyond the call of duty, in spite of the work they still needed to do. 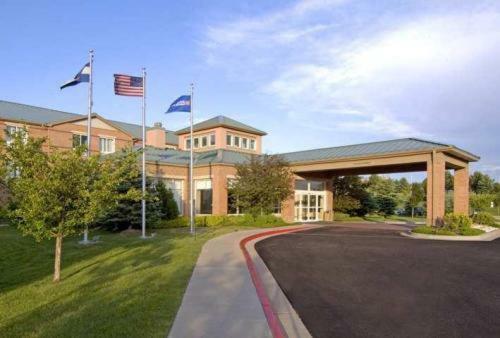 Hilton Garden Inn Colorado Springs This rating is a reflection of how the property compares to the industry standard when it comes to price, facilities and services available. It's based on a self-evaluation by the property. Use this rating to help choose your stay! Hilton Garden Inn Colorado Springs is set in Colorado Springs, 5.6 mi from Palmer Park. Guests can enjoy the on-site restaurant. Every room at this hotel is air conditioned and features a TV with cable channels. The rooms are equipped with a private bathroom. Dine at the on-site Great American Grill restaurant, or enjoy some snacks from the 24-hour convenience store. There is a 24-hour front desk, a cash machine and shops at the property. Garden of the Gods is 8.7 mi from Hilton Garden Inn Colorado Springs, while Peterson Air Force Base is 11 mi from the property. The nearest airport is Colorado Springs Airport, 12 mi from the property. When would you like to stay at Hilton Garden Inn Colorado Springs? This air-conditioned room features a cable TV with pay-per-view channels, a microwave, a small refrigerator and tea and coffee-making facilities. An private bathroom is equipped with a hairdryer. House Rules Hilton Garden Inn Colorado Springs takes special requests – add in the next step! Hilton Garden Inn Colorado Springs accepts these cards and reserves the right to temporarily hold an amount prior to arrival. Hotel was under construction but nothing they could do about that. Also a pipe leaked by my room door and smelled pretty bad but that was due to the construction, again not much they could do about it. We had dinner in the restaurant and there was only one guy trying to run the entire restaurant! Including the room service orders. We had to wait for a long time on each drink we ordered, and then decided to only get salads because the guy working there was clearly over whelmed. Not what I expected when we paid so much for the room. They need more staff in the restaurant! Pool very small, no hot tub. Breakfast seemed understaffed, many food items needed refills and area was a little dirty. Business guests were treated much better than tourists guests. The ambiance and the place. Everything was clean,staff is friendly. Their door slam and wake everyone up. Some furniture need up dating. No dresser for storing clothes.